When you add a content type to a list or library, site users can use the New Document command to create specialized content quickly. Important: To add content types to a list or library, you must have at least the Design permission level for that list or library. You also need to have multiple content types enabled. See Turn on support for multiple content types in a list or library for more info. If the list or library is not already open, click its name on the Quick Launch. If the name of your list or library does not appear, click Settings , click Site Content, and then click the name of your list or library. Click List or Library on the Ribbon. Click List Settings or Library Settings on the Ribbon. Under Content Types, click Add from existing site content types. If Content Types doesn't appear, click Advanced settings, and click Yes under Allow management of content types?, and then click OK. Note: If the list or library isn't set up to allow multiple content types, the Content Types section does not appear on the Settings page for the list or library. To learn how to allow multiple content types, see Turn on support for multiple content types in a list or library. Click the arrow to choose the group of site content types you want to select from the Select Site content types from list. In the Available Site Content Types list, click the name of the content type that you want, and then click Add to move the selected content type to the Content types to add list. To add more content types, repeat steps 5 and 6. When you finish selecting all of the content types that you want to add, click OK. When you add a content type to a list or library, you make it possible for that list or library to contain items of that type. In addition, users can just click the New Document command to create an item of that type. 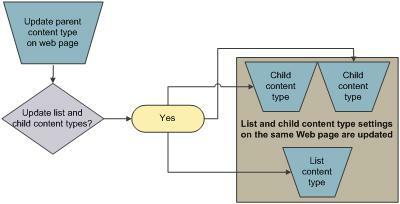 A single list or library can contain multiple content types, and each content type can have unique metadata, policies, or behavior. When you add a site content type to a list or library, it is called a list content type. The list content type is a child of the site content type from which it was created. It inherits all the attributes of its parent site content type, such as its document template, read-only setting, workflows, and columns. If the parent site content type for a list content type is updated, the child list content type can inherit these changes. A list content type can be customized for the specific list or library to which it is added. These customizations do not apply to the parent site content type. If the child content type shares attributes with the parent site content type, those attributes might be overwritten when the list content type inherits changes from the parent. If the list content type has custom attributes that the parent content type does not have, these customizations are not overwritten. You can specify the order in which content types are displayed on the New Document button for a list or library. By default, the first content type that is displayed on the New Document button becomes the default content type for the list or library. 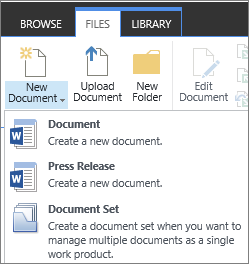 To change the default content type for the list or library, change the content type that is displayed first on the New Document button. You can also specify whether you want content types that were added to a list or library to be visible on the New Document button. Under Content Types, click Change new button order and default content type. If Content Types doesn't appear, click Advanced settings, and click Yes under Allow management of content types?, and then click OK. Note: If the list or library is not set up to allow multiple content types, the Content Types section does not appear on the Customize page for the list or library. To remove a content type from the New Document button for the list or library, clear the Visible check box. To change the order in which a content type appears on the New button, click the arrow next to that content type in the Position from Top column. Then, select the order number that you want. When you remove a content type from a list or library, users will no longer be able to create new items of that content type inside the list or library. 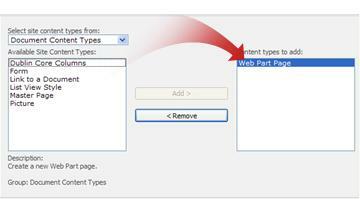 Removing a content type from a list or library does not delete any items that were created from the content type. Under Content Types, click the name of the content type that you want to remove. If Content Types doesn't appear, click Advanced settings, and click Yes under Allow management of content types?, and then click OK. Note: If the list or library has not been set up to allow multiple content types, the Content Types section does not appear on the Customize page for the list or library. Under Settings, click Delete this content type. When you are asked whether you are sure that you want to delete this content type, click OK.